Established since 1988, Ballina Campervans,Motorhomes & Caravans (BCMC) are award-winning ‘RV Specialists’. This year we were named BEST RETAILER/DEALER by the CCIA NSW. In 2015 were named BUSINESS OF THE YEAR by the Ballina Chamber of Commerce and STATE FINALIST in the CCIA NSW, Awards of Excellence. 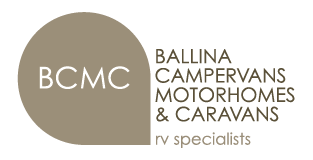 BCMC (Ballina Campervans, Motorhomes & Caravans) are specialist retailers of Campervan, Motorhome & Caravan recreational vehicles. We have a comprehensive range of New and Used Campervans, Motorhomes & Caravans. BCMC – Ballina Campervans, Motorhomes & Caravans – is the retailer for Horizon Motorhomes – featuring a large selection of built-in Motorhomes that are designed for max space and openness to enhance your outdoor touring experience. We are also the only retailer of Millard Caravans from Newcastle to Tweed Heads. There are semi-off road and off road options to suit the adventurer in you. Our RV Service Centre is dedicated to the maintenance and repair of campervans, motorhomes and caravans. This is supported by a complete range of services and accessories including add-ons, options and spare parts.